In the early 1960s, windshield wipers had only one speed. 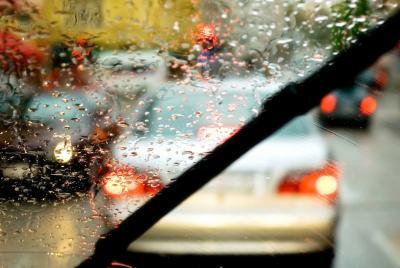 Realizing that drivers would be better served by wipers that could actually match the rain conditions they were driving in at any given time, Robert Kearns developed and patented an intermittent windshield wiper system. But merely creating a solution wasn't enough if they weren't making their way into cars. Hoping to spur adoption of his invention by the major car manufacturers of the day, Kearns shopped his creation around by bringing his prototype to their engineering departments. Unfortunately for Kearns, the major car manufacturers simply ignored the patent and had their engineers replicate the wiper system for their own use. A legal battle ensured and while Kearns ultimately went on to win patent infringement, his legal fight dragged on for more than a decade, bankrupting him and ruining his life in the process. The difficulties faced by small inventors trying to bring new ideas to the world got us thinking about community banks' efforts to inform consumers about the products and services they have available. While community banks usually don't have the burden of defending patents on their products, there is no doubt that the deeper pockets of competitors gives them a significant edge in advertising and promoting their services. As it turns out, in some cases community banks may be impeding their own marketing efforts. Despite widespread awareness about the importance of online and mobile banking services, many banks still fail to alter their marketing, according to the findings of the fifth annual "State of Financial Marketing" survey conducted by The Financial Brand. Based on survey responses, 90% of banks now use Facebook and more than 50% use Twitter, LinkedIn and YouTube. Yet there is a disparity between banks' realization of the importance of online, mobile and social marketing and the money they are putting behind such efforts. The survey also found that while the majority of banks have lowered the amount they spend on traditional offline marketing venues, 58% still use at least 50% of their marketing budgets or more, for traditional, hard copy advertising. When it comes to applying resources to electronic marketing efforts, 82% allocate 30% or less of their marketing budgets to online venues, while 90% allocate 20% or less to mobile marketing efforts. Meanwhile, the majority not only fails to analyze the effectiveness of online marketing efforts, but most don't even see data analytics as being very important. This means banks are putting energy into promoting themselves and their products online, with no idea whether their efforts are making an impact. Instead of blindly putting information online or blasting it to customer cell phones, banks would likely be better served to re-examine the ways they are approaching their marketing efforts. It is important to make sure efforts are in line with changes in the ways that people receive information. It is equally important for banks to assess the ways that competitors have altered their marketing to be sure that they continue to compete. Beyond the ways banks approach marketing, it makes sense to reassess the messages at the heart of your marketing efforts. Instead of moving away from product specific marketing and towards a more inclusive marketing approach, the survey found that most banks continue to build marketing strategies and budgets around a few individual products. Here, the survey found the top products that banks most heavily market are mortgage loans and refinancing (64%); mobile banking solutions (61%); home equity loans and lines of credit (43%); credit cards (42%); and auto loans and refinancing (42%). For their part, large banks have been increasingly highlighting mobile wallets and peer-to-peer services as well. Given this blanket approach by most banks, it makes sense to take the time each year to analyze the biggest needs of customers and to tailor your approach and delivery channels around that to gain maximum opportunity. As Kearns painfully learned, just having a great product is not nearly enough in this hyper tough and oftentimes unfair world of competition. Yields climbed 8bp after the April FOMC minutes strongly pointed toward a June rate hike, shocking bearish investors to unwind their positions. 1) Bank of Montgomery ($285mm, LA) will acquire Tri-State Bank and Trust ($32mm, LA) for an undisclosed sum. Some analysts are now projecting 2 more rate hikes this year, given more Fed speakers seeming to point that way in speeches and concerns over the strength in the US dollar. As global economies struggle to come out of recessionary situations and many battle with negative interest rates, investors in those markets have shifted to the US to earn something on their money. As such, the long end of the US Treasury market is expected to remain under pressure. A very wise insurance broker keeps telling us that 99% of frauds occur due to people not following proper procedures or protocols established at the bank. This can limit amounts covered by insurance, particularly if banks fail to respond to warning signs. We bring this up because it looks like 3 employees colluded and may have done that very thing after admitting to stealing close to $4mm from an Arkansas bank from 2005 to 2015.